Q: Tell us about MakerNet and where you see its potential for transforming business as usual in development? MakerNet is a consortium of tech, aid, and social enterprise organizations working to connect makers to markets. The maker movement is an untapped resource for local manufacture and supply chain optimization worldwide. In developing countries in particular, there’s an extraordinary opportunity for makers and making technologies to fill the production gap. Rather than waiting for national infrastructure and international trade to catch up with local consumer demand, makers can help their communities and countries leapfrog into Industry 4.0, creating products that can be locally designed, produced, and repaired, endlessly customized, and digitally enabled with the Internet of Things (IoT). Beyond these economic development benefits, MakerNet sees a major opportunity to integrate digital tech and makers into humanitarian aid supply chains. Emergency response and relief agencies rely heavily on imported products and equipment, and international procurement processes are slow, bureaucratic, and expensive—even after all the headaches and expense, you still don’t always end up getting what you need, where and when you need it. So helping grow the maker movement and expanding digitally enabled local production not only supports livelihoods and creates jobs, it can help aid agencies shorten supply chains and get access to high-quality, low-cost, locally sourced, and customizable goods. We wrapped up our pilot program in Kenya in February, which was supported by the BMZ (German Ministry for Economic Cooperation and Development)-financed GIZ program Digital World, as well as by IBM and Cisco. 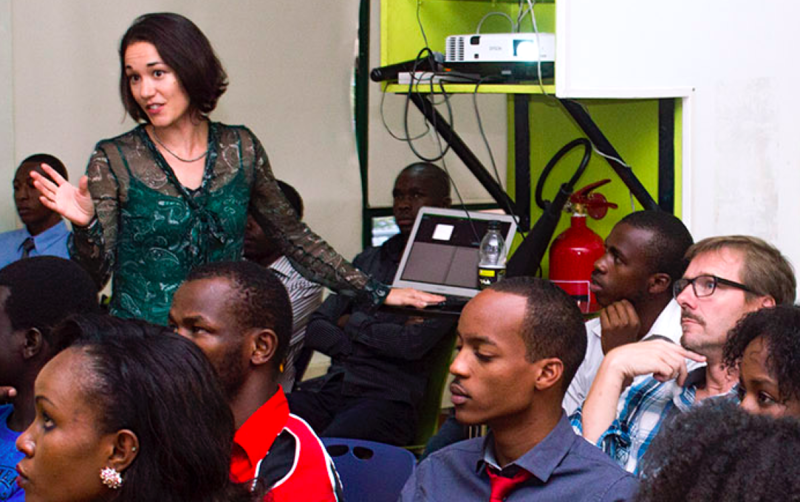 Nairobi is the administrative and logistical hub for most humanitarian and development agencies in East Africa and the Horn; it’s also home to one of the most vibrant tech entrepreneurship ecosystems on the continent and a growing maker community. So this massive demand—for hardware supplies in the aid industry—is sitting right next to the potential supply, the techies and hardware entrepreneurs, but no one had connected the dots. We set out to do just that and test the hypothesis: is there significant demand for locally sourced humanitarian and development supplies in Kenya, and if so, can some of that demand be viably met by Nairobi makers? For the pilot we focused on the health sector, as hardware is a major issue facing under-resourced clinics and hospitals—they have trouble staying fully stocked, or finding replacement parts for medical equipment that breaks down from normal wear and tear. Some clinics had machines lying around gathering dust, completely unusable just because a hinge or some other simple little part needed replacing. The machines were too expensive to replace, and replacement parts were either unavailable or too expensive to import. To solve this problem, our colleague Michael Gathogo, a Kenyan digital designer and maker-entrepreneur, visited clinics and assessed their equipment, then designed replacement parts for a variety of machines—a broken heating element for an autoclave, a broken valve leaking oxygen from an oxygen machine, broken centrifuge tube holders—and manufactured them at Gearbox, our partner makerspace in Nairobi. These repairs saved clinics money, and enabled them to offer their patients better care. We also used open source designs for basic noninvasive medical devices to produce 3D-printed products that clinicians could use. For example, we 3D-printed a fetoscope from an open source design by Field Ready, one of MakerNet’s founding partners, and brought it to a carpenter who was able to replicate it out of wood using a normal lathe. The wooden models were both cheaper than the 3D-printed prototype, and the wood also had better resonance than the plastic 3D-printer filament. Numerous use cases demonstrated a strong demand for low cost, on-demand, locally sourced supplies in the health care sector, and also that the design skills and production capacity to meet this need were also there. Critically, we also showed how coupling digital with traditional manufacture techniques resulted in a higher quality and lower-priced product than just the traditional or digital method alone could have produced. Q: How do you envision the impact of MakerNet’s work? The implications of this kind of work are boundless—from medical equipment to agricultural tools to school supplies, from village cooperatives to multilateral aid agencies, these technologies and business models have the potential to create jobs and businesses that help people access the stuff they need. Beyond MakerNet and this work in the development sector, open source design is unto itself a democratizing force in global manufacturing. The same way that open source software has enabled anyone with the skills to contribute to software projects and adapt existing software to their needs, open source hardware designs—combined with makerspaces giving people access to prototyping and small-scale production facilities—allow skilled individuals and small businesses to become a part of supply chains that they previously could never access. This can be transformative on both sides—customers, whether private consumers and companies or aid and government agencies, will be able to source and customize hardware products faster, and makers and hardware companies will be better able to reach and serve new customers. So part of our aspiration is to help consumers and producers benefit from open source design. Q: Where is MakerNet now that you’ve successfully completed the pilot? We’re looking to apply the MakerNet approach in further sectors and countries, and to expand our partner network. Also, for this approach to commercialize and scale in the long term, we need to tackle some of the more systemic hurdles, such as regulatory frameworks for IP and quality control and assurance. Frameworks differ from country to country so we need to invest in the research of the regulatory environments, as well as in outreach to the respective authorities to make sure there’s an enabling policy environment for makers and these technologies. For the pilot, we also developed a prototype open source design-sharing platform, Makepedia.org, and are exploring how we can incentivize makers around the world to thoroughly document their designs and inventions so that they can be more easily shared, replicated, and adapted. We’ve begun bringing together other stakeholders such as technical universities and research programs focused on documentation methodologies for open source, as well as governments, donors, and international technology and manufacturing companies to explore opportunities for partnership. This pilot was just the beginning! We’re excited to keeping growing the MakerNet network and build on what we’ve started.